RAIL passengers in the north of Scotland can expect to travel in “inferior, outdated” carriages once the new Border railway opens, it has been claimed. Union officials and politicians, as well as some rail staff in the Highlands, believe that the most up-to-date carriages currently used on north rail lines are to be switched to the Borders to “tart up” the new operation when it is launched in September. Abellio ScotRail has admitted that only one of its fleet of trains on the Borders Railway will be upgraded in time for Britain’s longest line re-opening. However, last night a spokeswoman could not confirm the controversial transfer of carriages. It is understood the company has listened to campaigners for the Borders service who argued that high-quality trains were needed to project the best image for the new service in an area that has been without a rail line for 46 years. Last month campaigners called on the train operator to draft in refurbished versions of the Class 158 trains from Inverness to get the Edinburgh-Tweedbank line off to a good start in September. The diesel trains are Scot­Rail’s least reliable, developing faults five times as often as its best performers. Built for British Rail, they also have slow-opening doors which have delayed passengers getting on and off. Highlands and Islands MSP Rhoda Grant has raised the issue with transport minister Derek Mackay, but he claimed it was an operational matter for Abellio ScoRail. Grant said: “There is clear concern in the Highlands over the potential redeployment of the Class 158 trains that service the north Highland railway lines to the new Borders Railway. “It is really unfair that rail passengers in the north have waited so long to get upgraded carriages, only for them to be taken away again to pander to those in the Central Belt and Borders. It seems to be the case again where the further north you go the worse the service becomes. Mick Cash, general secretary of the RMT union, said: “This exposes again the chronic shortage of the fleet throughout the UK. VisitScotland is about to launch a major campaign to boost tourism in the Borders to coincide with the opening of the new service. The older Class 158 carriages have been prone to air-conditioning failures, with narrower doors and a relatively cramped interiors. 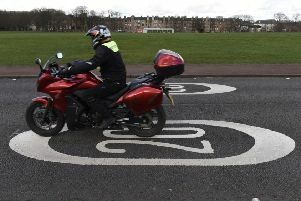 Units based in the Highlands have, however, been refurbished, with key im­p­r­ovements being more bike and luggage space and better matching of seats with windows. A spokeswoman for Abellio ScotRail said, “All of ScotRail’s Class 158 trains will undergo refurbishment which will see many improvements from carriage interiors to carpets and toilets, as well as an exterior rebrand in ScotRail livery.